In the Bible as the Divinely inspired inerrant Word of God, the revelation of His mind and will to man, our infallible, all-sufficient guide for salvation and the Christian life (2 Tim. 3:16-17, 2 Pet. 1:20-21). In one God, the Creator of all, eternally existing in three persons, Father, Son and Holy Spirit. In the deity of the Lord Jesus Christ, that He is true God and true man begotten of the Holy Spirit, born of a virgin and that He has a perfect and sinless humanity (John 1:1, Phil. 2:6, Matt. 1:23-25, 1 John 3:5). In the total depravity of the nature of man through his fall in the Garden of Eden, and the absolute inability of man to save himself from eternal punishment by his own works (Gen. 3, Rom. 3:23, Eph. 2:8-9). In the bodily resurrection of the just and the unjust, the everlasting blessedness of the saved (1 Thess. 4:17), and the everlasting conscious punishment of the lost (Rev. 20:11-15). In the finished work of Christ on the Cross of Calvary, through which sacrifice Christ has effected complete and eternal redemption; that God, setting His seal of approval on the work of Christ by raising Him from among the dead, enthroned Him at His own right hand in Heaven; and that Christ is the Head of the Church, the Lord of the individual, the High Priest over the House of God and the Advocate in the Family of God. In the immediate and eternal salvation of every person who truly believes on Christ and by faith rests on His finished work as the only righteous ground on which a Holy God can forgive sin. That all who through faith receive the Lord Jesus Christ as Savior are born again of the Holy Spirit, indwelt by the Holy Spirit and by the Holy Spirit baptized into the Body of Christ, the Church, of which Christ is the risen and ascended Head (1 Cor. 12:12-14, Eph. 1:22-23, Col. 1:18). That the early Church met together and "continued steadfastly in the apostles' doctrine and fellowship and in the breaking of bread, and in prayers" (Acts 2:42)--God's pattern for the Church today. In the personal, imminent, and pretribulational coming of the Lord in the air to rapture (catch up) the Church (1 Thess. 4:13-17). And In the revelation of Christ in glory at His Second Advent to the earth to establish His Kingdom on earth and to reign in righteousness. (2 Thess. 1:6-10, Phil. 2:9-11). Temporary structure that was build in the year 1985. Originally the congregation of Rurago church was part of A.C.K. St. Marks church Maragua situated 3km at the outskirts of Maragua town, it was indeed odd to leave the confines of town to attend the church service at the outskirts 3km away. 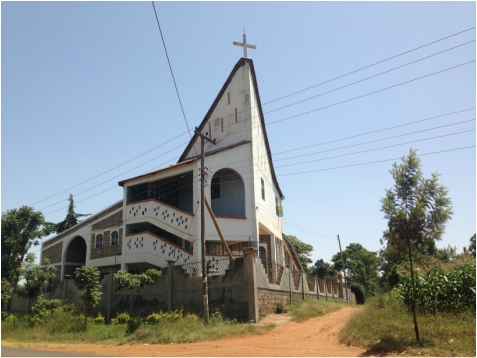 In the year 1985 the idea of a church was sold to the St. Marks church committee after which the search for a plot in Maragua town with purpose of building another church started. The 23 years of the walk of faith has led to the construction of a beautiful house of the Lord. Glory be to God.